Hey look, everybody! 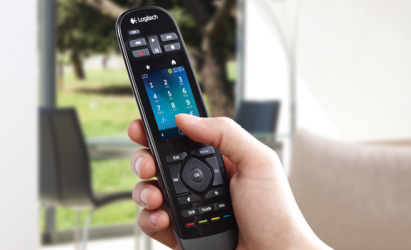 Logitech has announced a new Harmony remote control. That’s right, the Logitech Harmony Touch that Best Buy started selling over the weekend now officially exists. While it is certainly nice of Logitech to acknowledge the existence of the new remote control, there was not much to announce that we hadn’t already learned from the box that ashoemaker took a picture of. The Harmony Touch is a fairly traditional candy bar remote dominated by a 2.4 inch color touchscreen that supports taps and swipes. The touchscreen can be used to control activites as well as provide direct access to up to 50 specific channels, complete with channel numbers and customizable channel icons. The placement of the transport controls above the touchscreen, near the front end of the remote control will probably be a sticking point for anyone not interested in Logitech’s vision of controlling the home theater from a touchscreen, though. The Harmony Touch will sell for $249, comes with a charging dock, and supports up to 15 devices via IR. One interesting note from the Logitech blog suggests that the MyHarmony.com website where users register and setup their remotes has been changed to allow users to swap out an old remote for a new remote. Given how inflexible the MyHarmony.com account system has been in the past, even this small change will be welcome for long-time Harmony users, though I suspect that MyHarmony.com still does not allow for more than one Harmony remote to be registered per account at one time. It features a simple, streamlined design and a touch-screen that lets you smoothly swipe and tap your way to your favorite entertainment options, including one-touch activities such as “Watch TV” and “Listen to Music.” Channel icons and numbers for your favorite networks are automatically provided based on your location and TV service provider, and you can add, remove and organize your favorites right on the remote. NEWARK, Calif. — Oct. 3, 2012 Today Logitech (SIX: LOGN) (NASDAQ: LOGI) announced the next generation of its award-winning line of Harmony® remotes, the Logitech Harmony® Touch. This premium advanced universal remote gives you customization with an intuitive color touch-screen for unprecedented control of your home-entertainment system. New screen position looks good for channel switchers but not DVR users. You have been able to switch out the remote connected to an account for years. All you have to do is connect the new remote and sync it. The system recognizes the new remote and makes the necessary changes. Though I still wish I could have multiple remotes connected to an account. Also if you call support you can get them to copy an account to a new account. Good to know about the syncing. I could swear that the last time I bought a new Harmony, it would not let me get rid of the old one, but maybe I never actually synced it for some reason.